Coachman Lakes community in Jacksonville, Florida. Coachman Lakes is a new residential community located in Southside area near premier shopping, fine dining, entertainment, Florida Community College Jacksonville, University of North Florida, Naval Station Mayport and the Beaches. Residents enjoy picturesque lake, nature trails and children playground. Built in 2002, community builders are DR Horton and Mattamy Homes (formerly Atlantic Homes.) 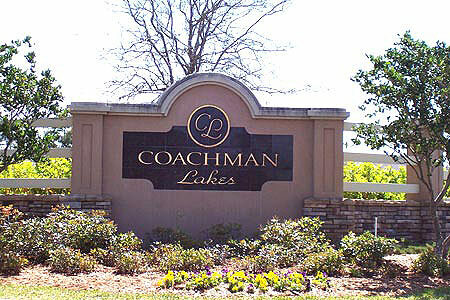 Coachman Lakes offers a variety of homes from the $200's. The community is conveniently located near schools, colleges, shopping, dining and entertainment. A quick ride provides access to Interstate 95 and area's hottest beaches.